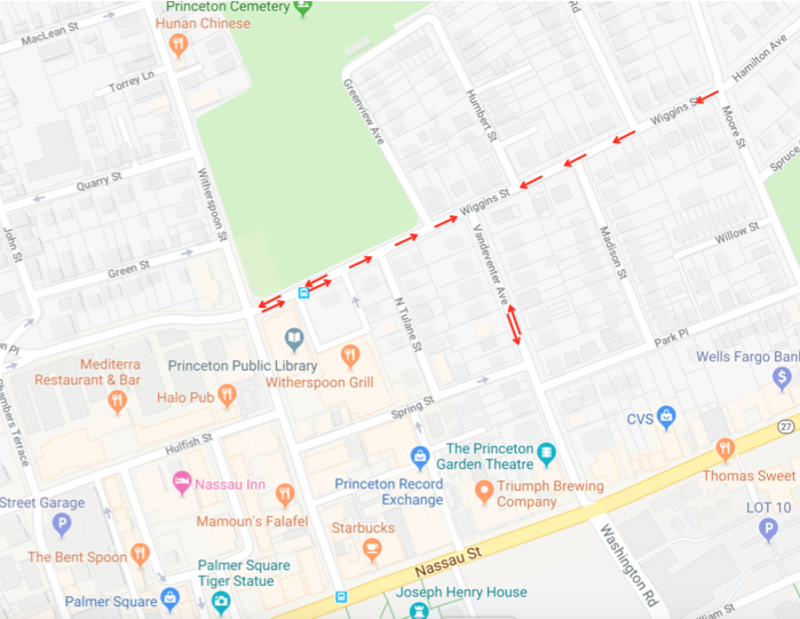 Consultants hired by the town of Princeton have begun work on a ‘Corridor Study’ of Paul Robeson Place, Wiggins Street and Hamilton Avenue between Route 206 and North Harrison Street. The study aims to “examine traffic, safety, and mobility issues within the corridor, and examine potential improvements including pedestrian and school crossings, intersection improvements, traffic calming, on-street parking, and bicycle facilities.” What kind of changes to ‘the Wiggins Street Corridor’ could make it work better for the town and nearby residents? The town faces a challenge to strike the right balance on Wiggins St. One goal to make the street safe for all road users. Last year the town conducted a trial of painted bike lanes on part of Wiggins Street and Hamilton Avenue, to see if they would be compatible with other road uses. The town also hopes to provide space for car parking on these streets, and to continue to to help drivers bypass traffic on Nassau Street. But is it really a good idea to invite traffic into the neighborhood? The idea of opening the Hamilton-Wiggins corridor as an alternative cross-town route for traffic belongs to mid-20th-century traffic engineers, who even displaced the African American residents of Jackson Street to make a convenient alignment along what is now Paul Robeson Place. For decades, the goal has been to move as many cars as possible through the neighborhood. It may be time to return Wiggins Street to something more like a normal residential street. Residential Street Concept for Wiggins Street, Princeton, with safe bike facilities, parking, reduced traffic volume (click to expand). 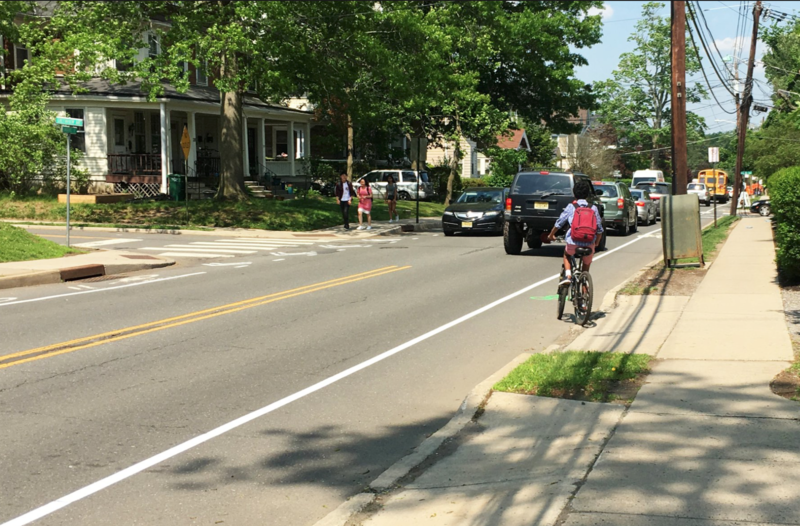 Bike lanes separated from traffic are known to be the safest, and would make a good facility for students at the High School, who might use them to go to the Princeton Public Library. Currently, the high volume of traffic on Wiggins Street, which often goes at up to 35 mph, makes it a risky place to cycle. Many cyclists use the sidewalks instead, which is also unsafe, and bothersome to pedestrians and dog-walkers. A high-quality, bidirectional bike lane would substantially reduce conflicts between cyclists, walkers and cars. In the future, it would likely be used increasingly for zero-carbon personal mobility devices, and e-scooters. Trained drivers of emergency vehicles could also use the bike facility in urgent situations, to bypass the one-way system. This concept would also maintain existing on-street parking options, which local merchants have said is a priority. The single-direction traffic concept is not something new for Princeton. It is already in use on John Street and Spring Street. It would take some getting used to for sure, and a trial in summer months when traffic is light may be desirable. The biggest risk is that traffic might be displaced onto other streets, but in reality, out-of-town drivers are likely to adjust their routes in the long-term to avoid the area. That is desirable, because out-of-towners should be using state and county roads instead of residential streets to get around Princeton. The consulting team who are working on the Wiggins-Hamilton Corridor Study are continuing to meet local stakeholders in the coming weeks including members of the business community. Hopefully they will be meeting members of the Witherspoon-Jackson Neighborhood Group as well, because the study area includes Paul Robeson Place, and these residents should have the key role in deciding what improvements are appropriate there. For the rest of the Wiggins-Hamilton Corridor, it is to be hoped that the consultants will keep a broad mind about potential solutions, and try to find something that works for the largest number of people. * Several people have pointed out that it might make more sense to turn traffic at Moore St instead, to relieve traffic at the intersection of Vandeventer Ave & Nassau St. This entry was posted in Alternative Transportation, Biking, Complete Streets, Placemaking, planning, Princeton, Sustainability, The Parking Question, Traffic, Walking. Bookmark the permalink. Why is the town paying for a survey before the change of road patterns traffic lights at road and the closing of Terhune at 206. This will cause a change in through traffic. The Wiggens, Paul Robison, Avalon are will be affected.